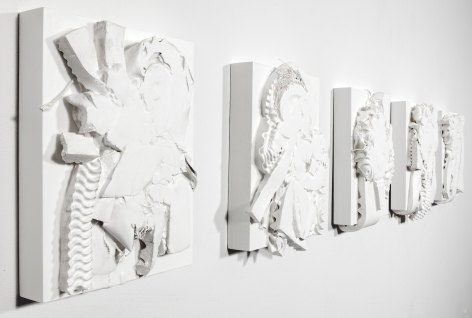 JONATHAN FERRARA GALLERY is pleased to announce Interruption, an exhibition of New Orleans-based artist Sidonie Villere. 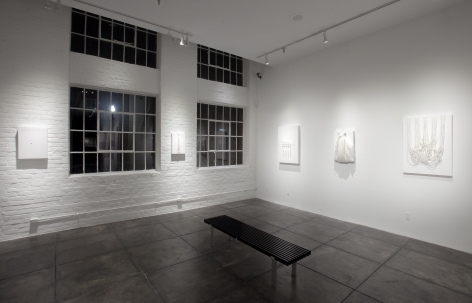 For her sixth solo exhibition at the gallery, Villere presents mixed media painting and sculpture in her quintessentially all-white, minimalist style. 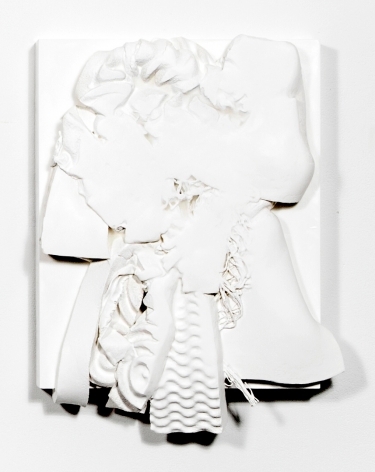 This new body of work marks a departure from her typically ceramic based exhibitions. The exhibition will be on view in the main gallery 31 May and run through 22 July with First Saturday Gallery Openings on 3 June and 1 July from 6-9pm. Villere speaks on the inspiration for this series . . . When our flow of thought is interrupted, whether by an interior or exterior force, we go through many possible emotional and conceptual episodes. 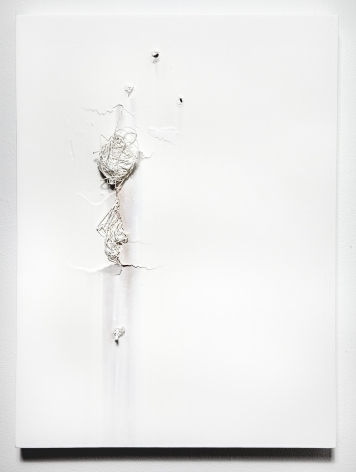 Whether they help us or hurt us, this work explores the incidents that occur after the interruption. Curator Dan Cameron, who wrote the essay for the exhibition, elaborates . . .
A commonplace of human experience, this is true in art as much as in any other area of human activity, is that our instinct for adaptation is most keenly felt whenever we expect continuity but instead experience its opposite; and Villere has seized upon uncertainly and discontinuity as a means of vaulting her practice forward. 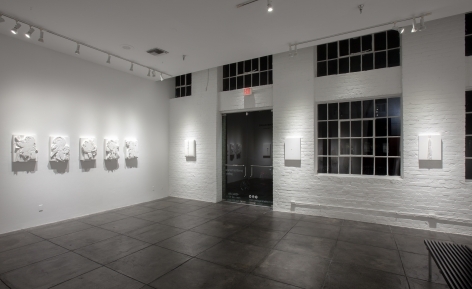 For further information, press or sales inquiries please contact the gallery director, Matthew Weldon Showman, at matthew@jonathanferraragallery.com or at the gallery +1.504.522.5471. Please join the conversation with JFG on Facebook (@Jonathan Ferrara Gallery), Twitter (@JFerraraGallery), and Instagram (@JonathanFerraraGallery) via the hashtags #SidonieVillere, #Interruption, and #JonathanFerraraGallery. 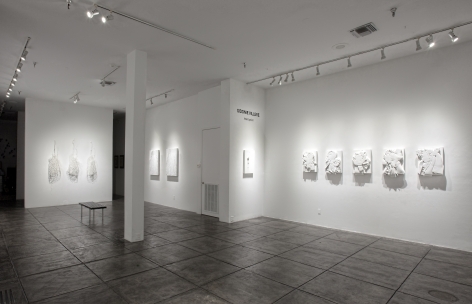 Sidonie Villere’s newest group of works, gathered under the single umbrella name Interruption, is her first not to have been created using ceramic as its primary material. 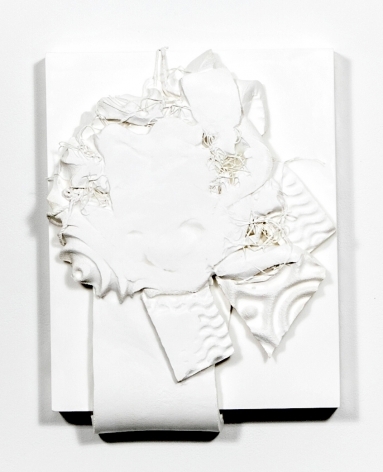 For an artist with nearly two decades of continuous production to build off of, who has unapologetically identified with fired clay since her student days, this alone signifies a major shift in her process and technique. 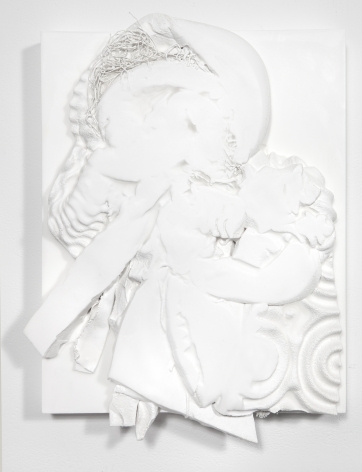 Another striking characteristic of Villere’s new work is the curious way it straddles the neighboring territories of painting and sculpture, without ever quite revealing to which side it pledges fealty. The results suggest not so much a concession to genre as an intuition-driven refusal to concede that her process falls into any fixed category at all. By choosing an over-arching theme with such dynamic implications, Villere seems to be signaling to herself (and us) that a fundamental transformation of her approach to making art is underway, with its main identifier a coming to terms with new sources of knowledge and life experience demonstrating that the old and familiar ways of seeing things and working in the studio no longer suffice. It is not a realization that needs to be borne out through experiment so much as an implausibility-turned-reality whose limits need to be constantly tested in order to determine where, if anywhere, its boundaries lie. A good case in point is one of Villere’s earlier experiments — a primed wood panel that was roughly abraded, gouged and punctured, as if to demonstrate that the integrity of the picture’s surface and support was a cruel hoax crying out to be debunked, by force if necessary. 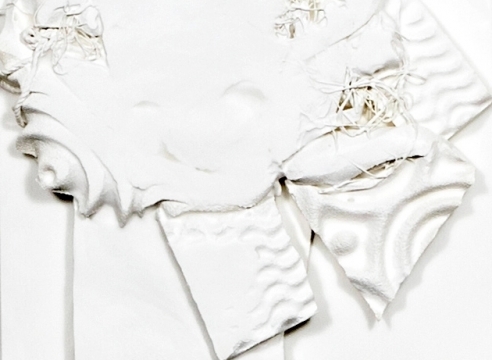 Such physical distress notwithstanding, the off-white and ‘natural’ tints that Villere mixed into the object’s base primer add a surprisingly lyrical touch with a faint but requisite nod to the informalist spirit of early Cy Twombly or Lucio Fontana. Having failed to destroy her creation, Villere has in turn embraced it as the survivor of its own ontological limitations. That this picture-object turned out to be a one-off helps to illuminate what has transpired in its wake. 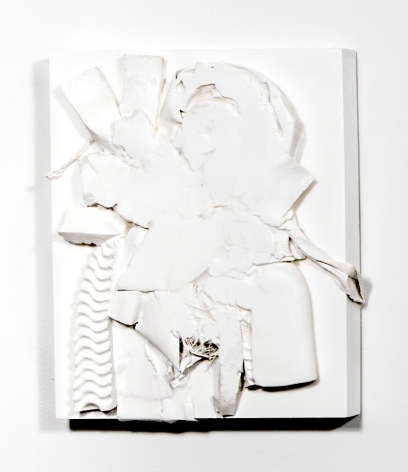 Unlike previous works, which were painstakingly developed using the trial-and-error method familiar to ceramics — whereby innumerable forms are destined to collapse or shatter in the kiln —. 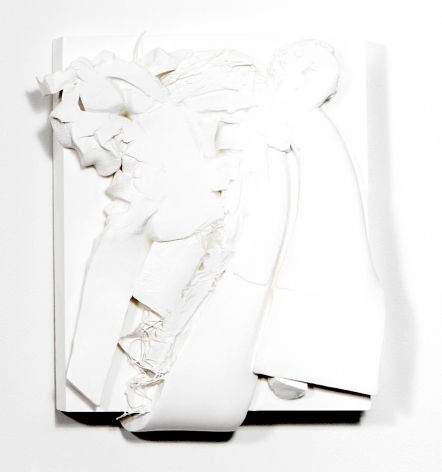 Villere has referred to her newest pieces as ‘partials,’ which at its core describes an object that has not been subjected to such an ordeal — that is, it appears to be only partly made. Within the overall scope of Interruption, she seems to suggest that the continuity of a multi-stage work process is no longer as compelling to her as a scenario in which objects do not flow into the world as part of a discernible pattern, but tumble out piecemeal, since each unique work and grouping is completely free to contradict or disregard the one that came before. A commonplace of human experience, this is true in art as much as in any other area of human activity, is that our instinct for adaptation is most keenly felt whenever we expect continuity but instead experience its opposite; and Villere has seized upon uncertainty and discontinuity as a means of vaulting her practice forward. Naturally, any pattern of discontinuity must by definition also affect its own principles, so that variations on the same theme will also exist, right alongside the lone singularities that have no visual counterparts. A row of five Polaroid photos, in which all recognizable imagery has been replaced by a blank white field, seems orderly enough, but even a knowledge of their identical state becomes difficult to accept, as one’s eye darts between them, searching in vain for slight differences in light, tint, paper color or exposure. 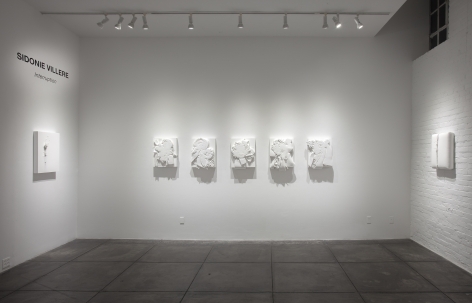 Not far away, five blocky plaster reliefs, their irregular surfaces riven by bumps and contours produced by fragments of found materials, appear to have not been made by the same artist, so richly varied are their jumbled contents and extensions of fiber and twine. 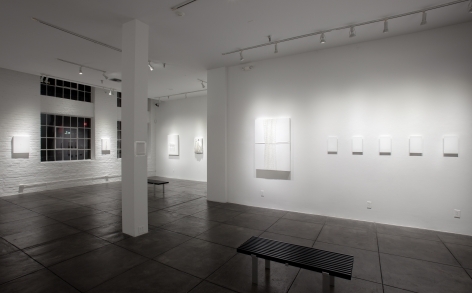 Within these boxy compositions, the identities of individual forms are resolutely blurred, their smooth white surfaces transformed into mute, ambiguous traces of everyday objects whose use and identity no longer matter. 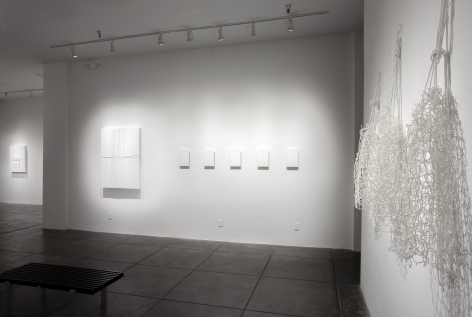 Although most of these new works fall into the category of relief, and their materials range from wool, plaster, wire, plastic, burlap net, string, foam, muslin, fishnet, soccer netting, golf ball netting, aluminum, canvas, tissue paper, nylon stockings, duct tape, acrylic and paraffin wax on wood and gesso board, it’s difficult not to think of them as rumination of the medium of painting. 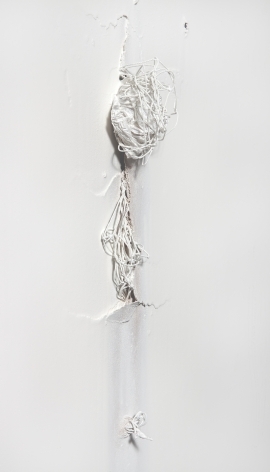 In one small painting, a row of three punctures are reinforced by a tear in the surface, out from which a small, unprepossessing tangle of plaster, wire and twine, recalling the abject figures in the postwar paintings of French artist Wols, pokes its way through. Suggesting in some ways a project that has been ruined and discarded before it really even got underway, it also suggests new beginnings, and a way of thinking about making art is which the ‘making’ part is subject to interpretation. 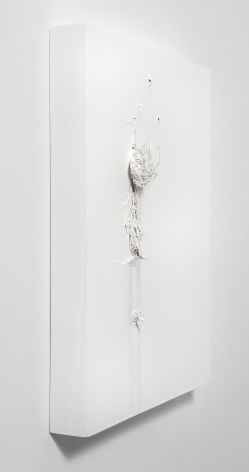 Other painterly gestures within Villere’s rapidly expanding toolbox include a tangle of rope that has been draped and looped, elegantly but impractically, across the front of a white picture plane; a length of loose white plastic netting wound vertically and erratically over the picture’s face, and held into place by two irregular horizontal lengths of packing straps; and a burst of muslin, netting and pure cotton that seem to gush from the top of a white panel, on top of which a harsh twist of metal wire suggests a barbed wire halo. 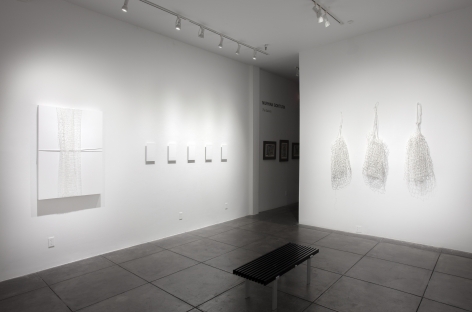 In all three of these examples, plastic, rope and textile are used as stand-ins for paint, and held together by the binding force of the white monochrome panels that provide consistent pictorial support. 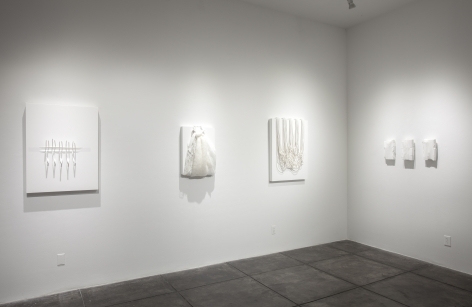 In a pair of her recent ‘paintings’ made from tennis netting and plastic bags, Villere’s actions are oblique but also deeply evocative. The basic underlying form in each one is an upward-pointing triangle, its points blunted by the top and edges of the panel. But the viewer’s attention is drawn instead to the interior of the triangle, with its mushy, eloquent bunching of the net’s threads and grids; and to the topmost edges, from which the plastic bags peer out as a kind of refutation of everything below them. They are both thoroughly abstract and eerily portrait-like, as if each one is concealing the traces of a specific person, whether real or imaginary. Most compellingly, they seem like works that were halted halfway through their making, as if the discovery of something unexpected gave way to the underlying premise that sometimes art’s greatest source of appeal is that it requires us to complete it — to discern the ghostlike qualities that it is equally determined to keep hidden.